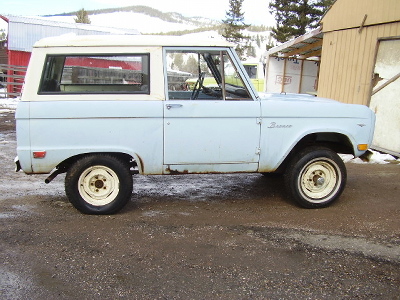 This 1976 Bronco Sport came to me in excellent near stock condition. Other than rusty floors the body was near perfect . All the bits & pieces are there & in working order , even the jack is still in it's original sack ! 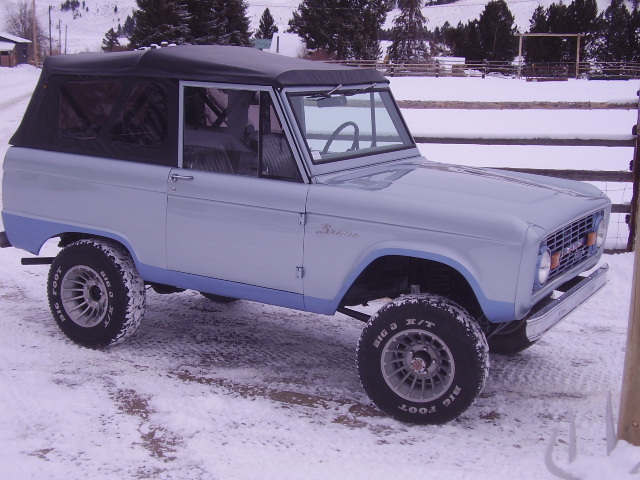 This 1972 Bronco has the basic 302 V-8 , with 3 speed manual transmission. 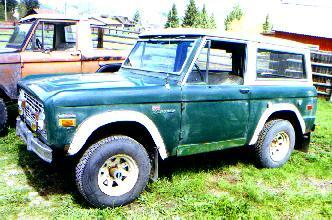 This 1970 Bronco Sport is in close to original condition, & has only minor rust. Powered by a 302 with 3 " on the tree ". Will make a great driver . It has a custom built half top , strong 302 , rebuilt front end , 8x15 8 spoke wheels , refinished in Wimbleton White .. 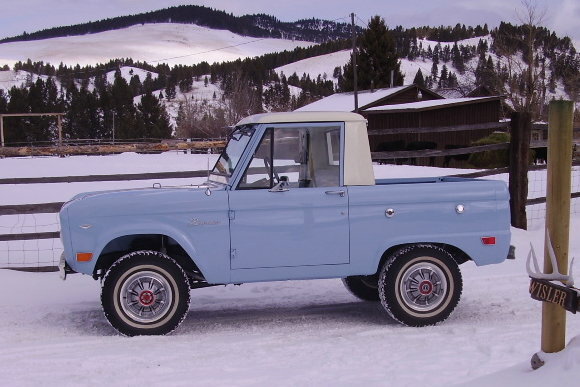 This 1975 Ranger is a low mile straight outfit. 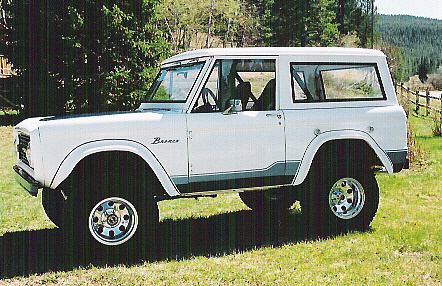 Powered by a 302 with Auto trans & equipped with power steering . 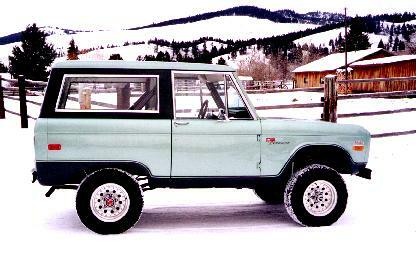 Well , every true Bronco fanatic MUST at some point own THE original Bronco , the 1966 . Here's our first ! 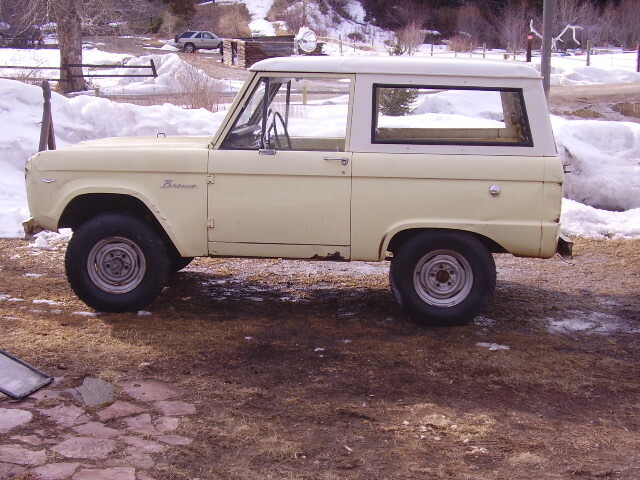 This ' 66 has only a little rust , a rebuilt 170 6 cyl , 3 speed on the floor , & removable door window frames. 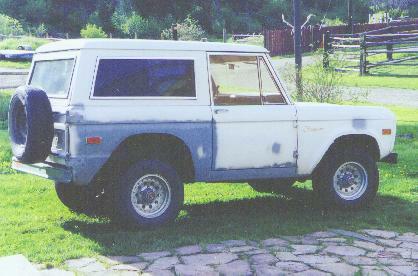 This one is a 1972 Sport . 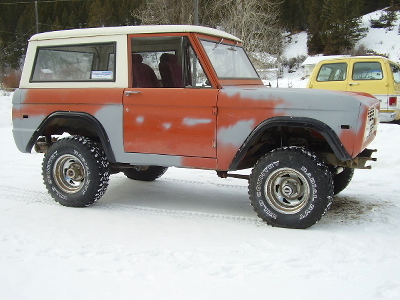 Came with a new 302 , headers , has 3 speed on the column , aluminum slotted wheels , etc. Ugly paint but pretty sound rig . 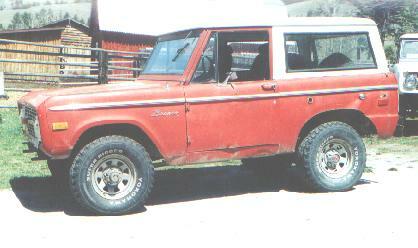 Will be getting a Dana 44 power disk conversion & power steering. Gobs more goodies on this one . Well , finally came up with another 1/2 cab . 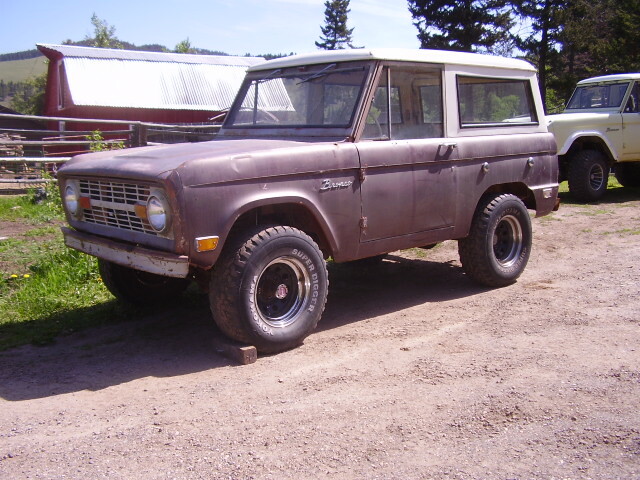 This one is a 1967 with a 289 & a 3 speed trans . It appeared to be an ex-Government vehicle once upon a time . 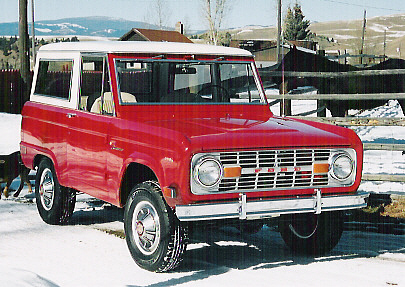 The Bronco's shown here are all Bronco's I've bought , restored & sold . 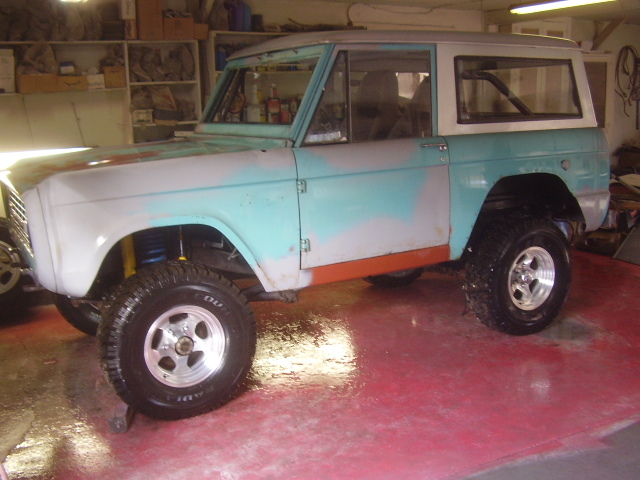 I've put before & after pics here but you can view the finished product on the " Restorations " pages . Picked me up another '66 . This one is uncut , 289 , 3 speed . 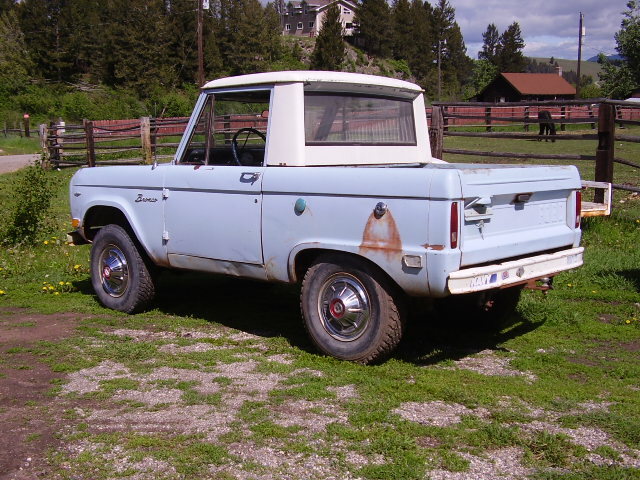 Pretty complete original Bronc . 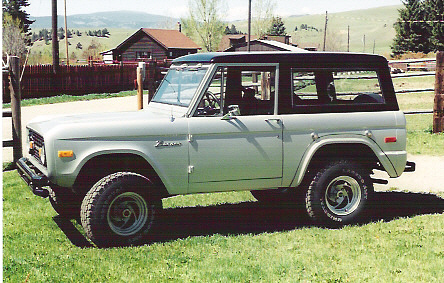 It will receive a restoration back to the way it looked when it rolled off the assembly line in 1966 . 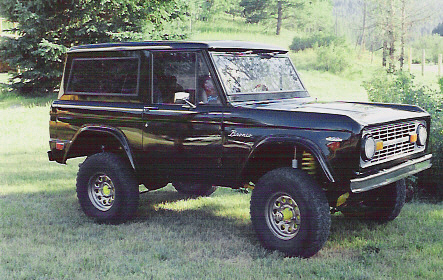 This one is a 1974 . 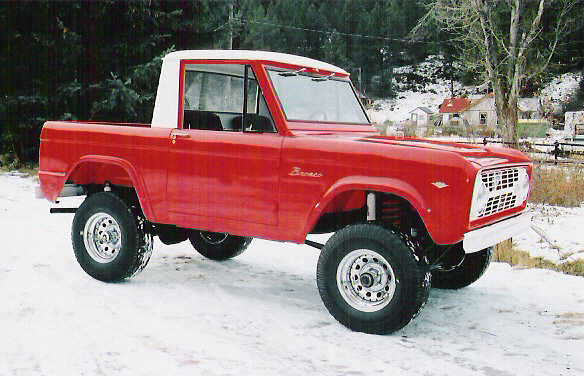 Has 302 , 3 " on the tree " , Dana 44 & power steering .. 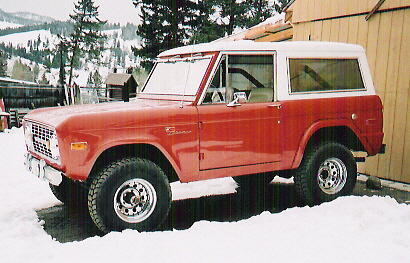 This '69 was my first resto for resale . 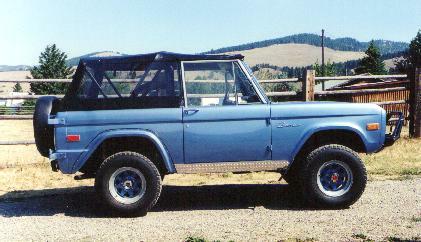 It has a 4" lift , built 302 , high rise, headers , 4 barrel , 3 speed on the column , custom interior . 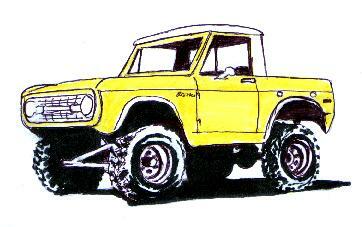 Duff power steering conversion . 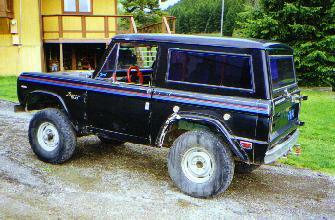 BFG 33x9:50 tires on stock width wheels . 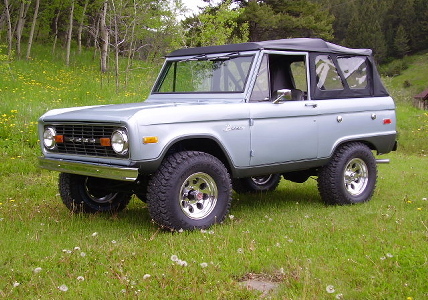 1970 Bronco , 302 , 3 speed . 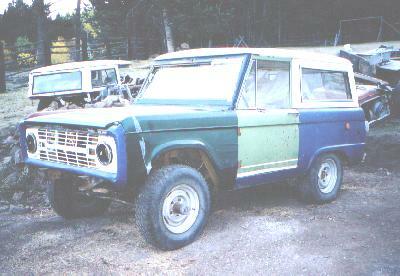 rust free Bronco , uncut .Needs a complete restoration . 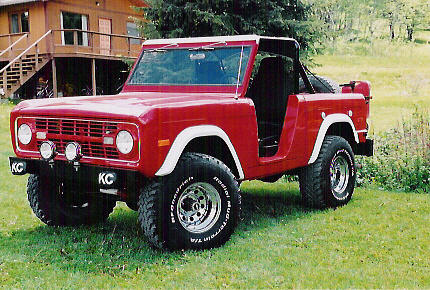 Now this is an interesting Bronco ! 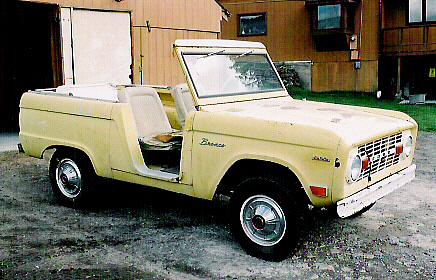 It's a 1969 U15 that was converted to a roadster a LONG time ago . It has 41,000 original miles , 302 , 3 speed on the column . Just pretty much all stock , little or no rust . "face lift " . It is now a roadster . 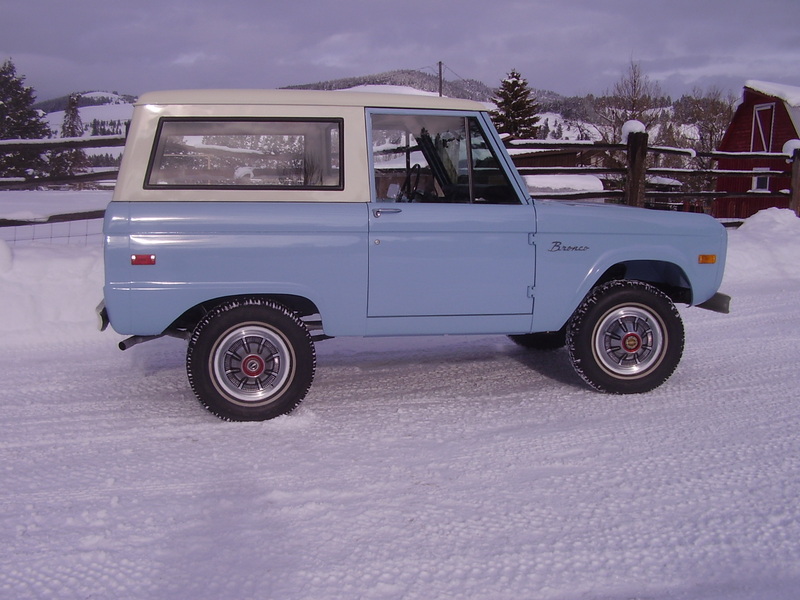 It has a 302 , 3 speed on the floor , 3" lift & a cool on-board air compressor system . 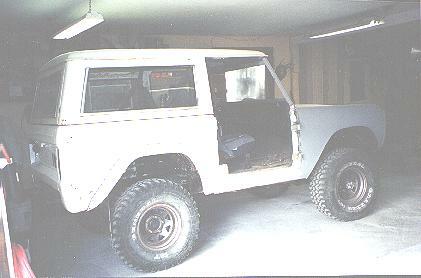 Power steering & a C-4 auto trans with Hurst floor shifter. 302 with Holley 4 barrel , Offenhauser manifold , headers with FlowMasters . Petronix electronic ignition . New paint : PPG Omni Hot Ginger Metallic , base coat/clear coat . 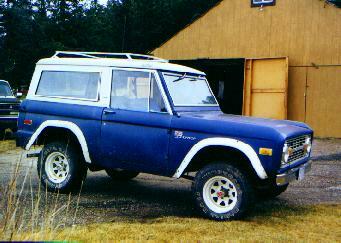 1969 Sport , 302 , almost rust free . 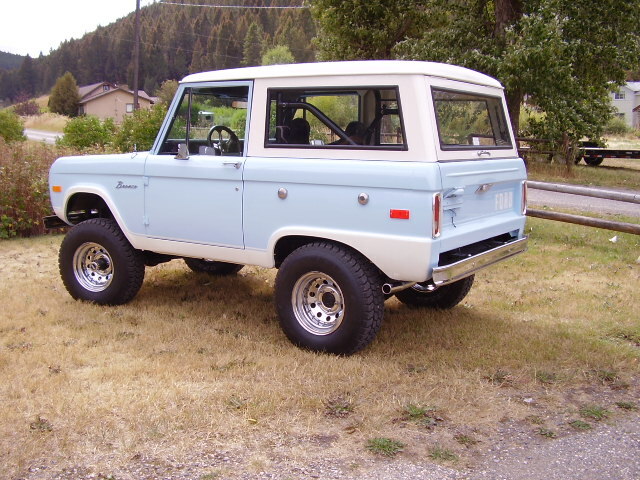 Pretty nice uncut Bronco . 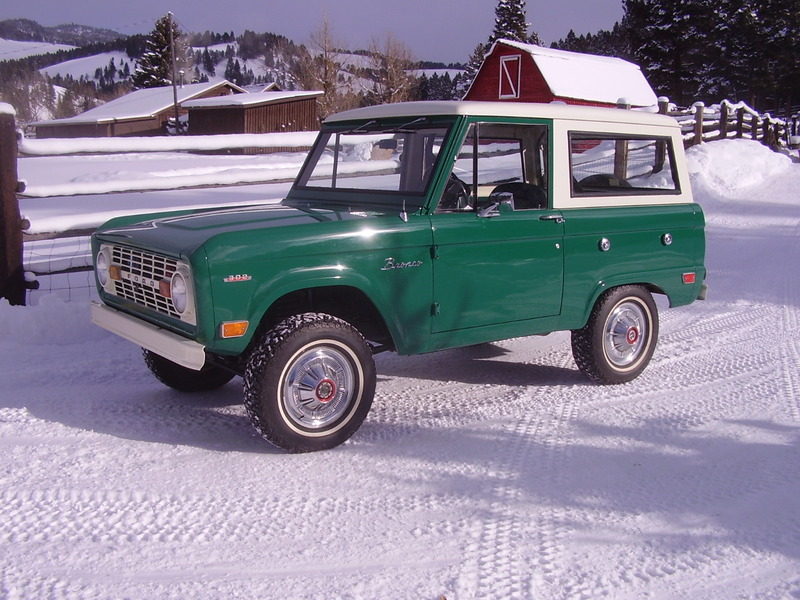 This Bronco has been restored to show-room stock condition . 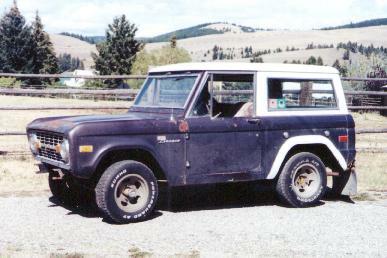 302 , C-4 auto , power steering . 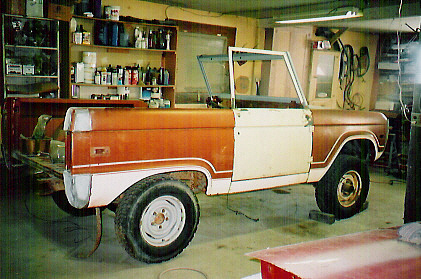 It's getting a semi-stock custom restoration . Very stock , uncut , minor rust , 302 & 3 speed . 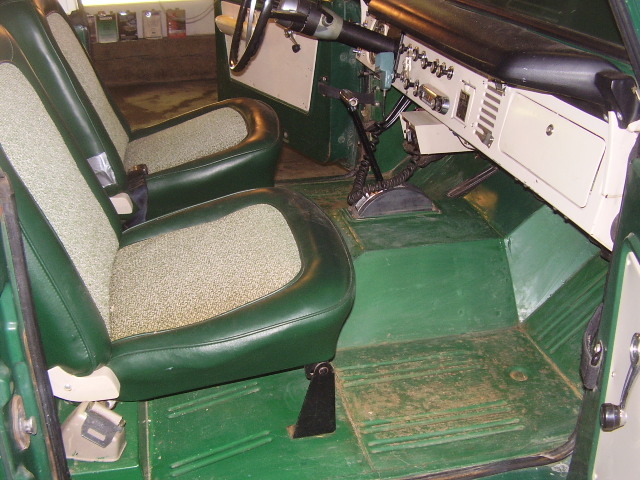 It's a little different as it has no rear seat & a bulkhead (divider panel ) . 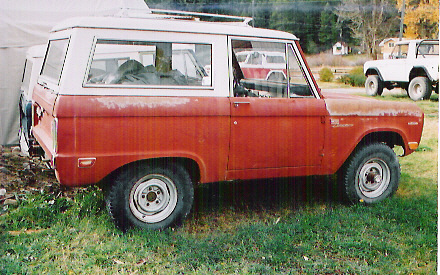 Originally came with a bench seat & was called a utility wagon . 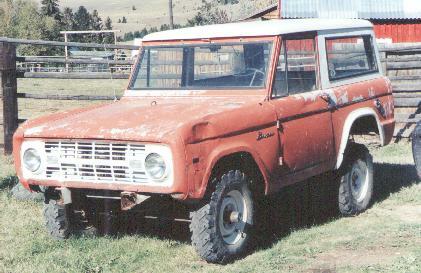 351W with serp drive , 3 speed on the floor , power steering , disk brakes . 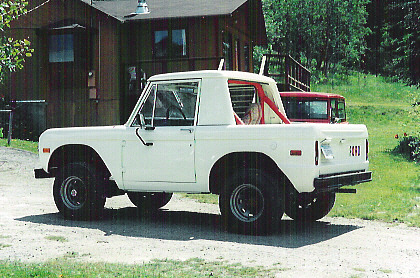 3" body lift , 31" tires . 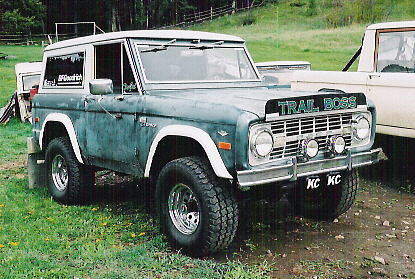 This is the first 1968 that I've owned & completes owning at least one of every year Early Bronco built . 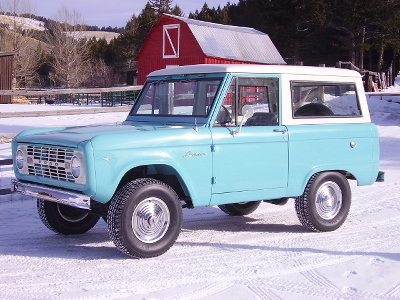 This '68 is very stock & original . 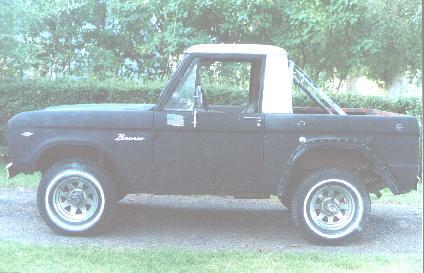 It is a U15 with a factory bench seat & bulkhead panel . 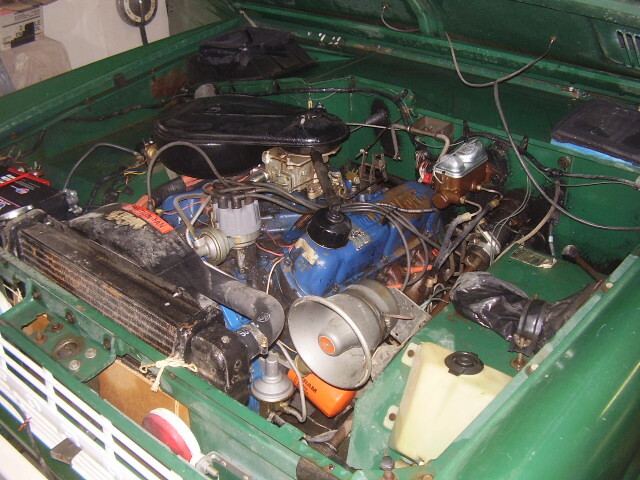 The engine is a 289 & has the 3 speed trans still on the column & also the original AM radio . 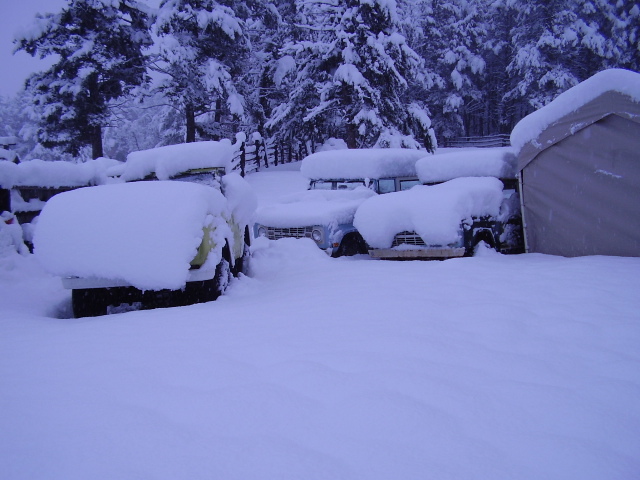 Hmmm.... something happened over the winter ..... it morphed into a 1/2 cab !! Got me another '66 . 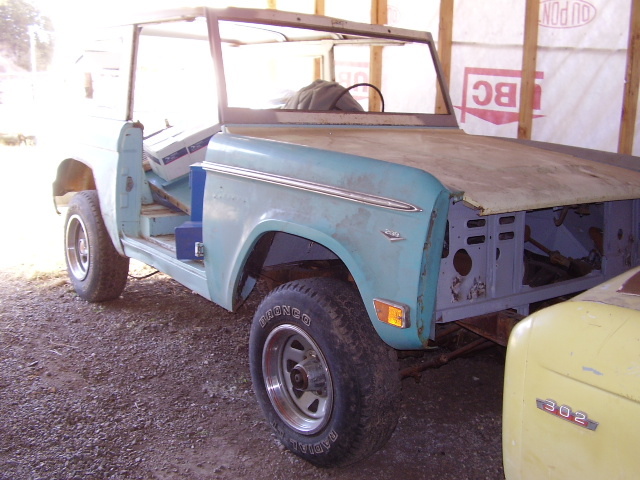 This one is original with a 289 & is complete minus the wheel covers & rear view mirror ... even has the correct rear mounted jack ! Pretty much rust-free , 302 , 3 speed . 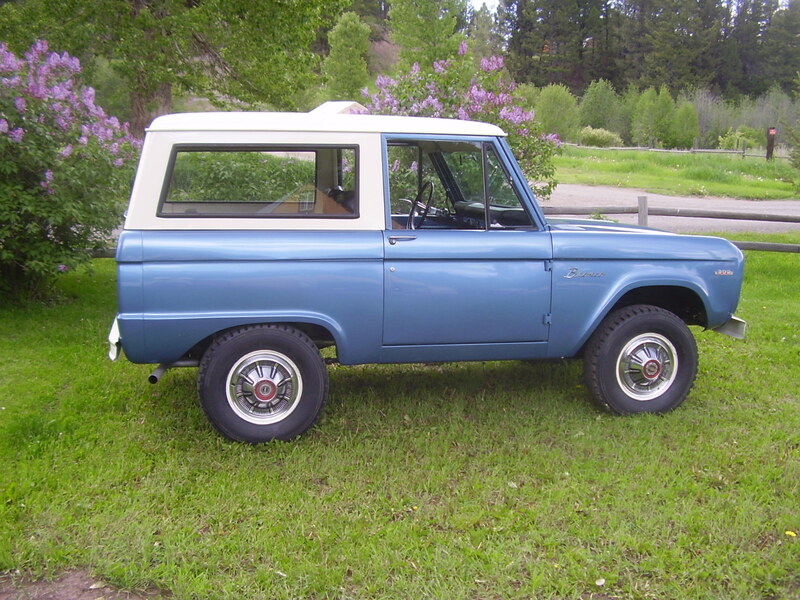 This is one cool '69 Bronco that I picked up . 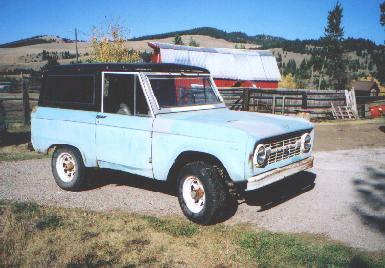 Very original & rust free too . 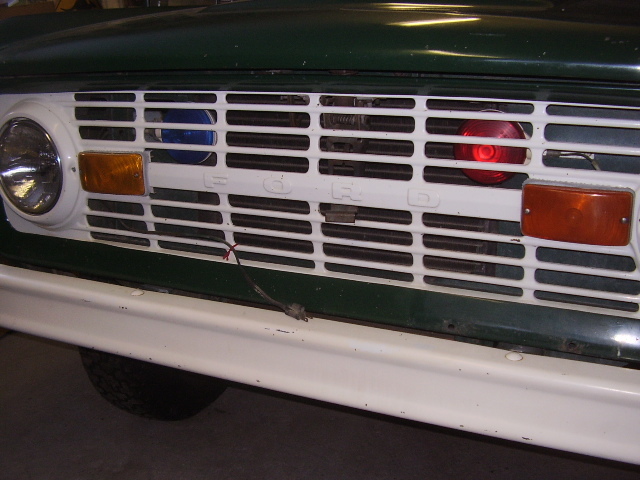 It was used with the Sheriff's Auxiliary & still has the lights behind the grill , a siren & P.A . 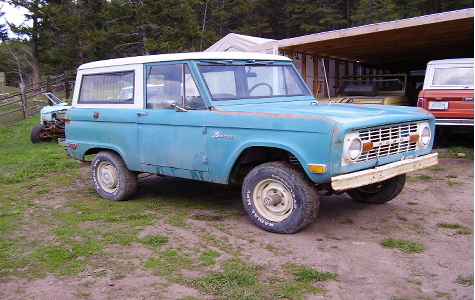 This is my latest & first project Bronco in at least 4 years . It's a low mile '66 U15 that is heavily modified . 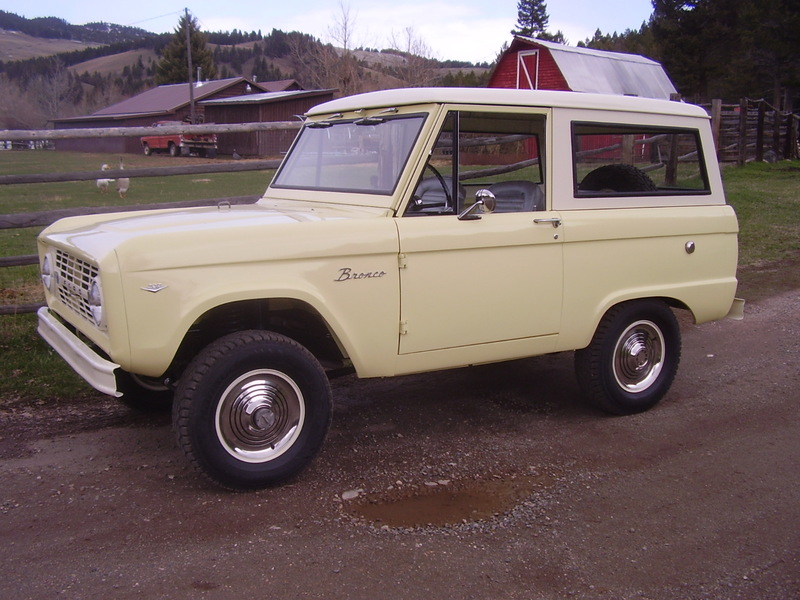 It's one of the earliest Bronco's that I worked on back in the early days of the business . The owner , a friend , decided he would never get it finished so he sold it to me . I hope to have it completed & for sale sometime summer 2015 .